A wedding is the most precious day you have dreamed of since you were young. Have you always imagined how you would look on your big day, are all of your dreams are falling into the right place? Have you finally found “tour dream wedding dress and the place you have always imagined exchanging vows with your special person? How about your hair and makeup? Hire bridal makeup artist in Delhi if you are concerned about that. We travel to any location within the country’s capital and our experts are even ready to commute along with you to other cities or countries. Do you want to look special at this memorable event? Did you spend a lot of time picking out your wedding dress, ring, shoes, and accessories and you just want everything to be perfect? Hiring a makeup artist in Delhi will complete your look. We are here to make you look perfect on the special occasion. Bridal makeup is unique compared to other events as a bride has to look her best and her makeup should draw others attention towards her. Our makeup artists Services can improve your beauty while maintaining your natural charm. Don’t worry about the charges, we offer budget-friendly packages for our beloved customers. It is necessary to look beautiful during weddings as it makes your face more cameras friendly. You may look blotchy or patchy the makeup is not so good or not as per expectations. Even a beautiful face can lose its charm id the makeup is not done properly. 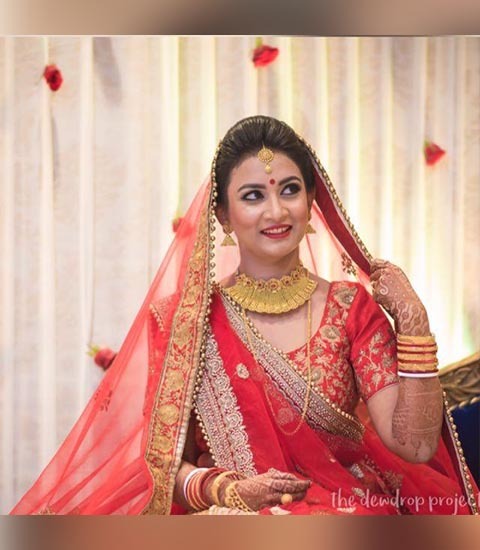 Hiring a bridal makeup artist in Delhi can make your face shine so that your wedding photos can contain that beautiful face forever is necessary. You can have big luminous eyes with full luscious lips and a delicate nose on your wedding day. Why you need to choose us for your make up needs is, we use only high-quality cosmetics to bring out your true beauty in your face we examine your face and determine potential highlights and drawbacks before implementing anything on your face. Our bridal makeup artist in Delhi ensures that positive facets of your face are highlighted and any drawback is toned down. Don t worry about your appearance on the wedding day as we will make you stand out like a confidently on your big day by applying makeup that suits your face and the theme of your wedding. You’ll look and feel special. On the day of your wedding, you may be so emotional and excited that you may be too nervous to apply on your own. We are your bridal makeup artist in Delhi who will make sure your makeup stays beautiful and fresh throughout your wedding. The look that we create will compliment your personal taste and your style. The factors such as photography and lighting effect and how your makeup will be considered before experimenting anything on your face. Come out of your tensions by hiring us as you didn’t need to do the work on your own. Just call us and our bridal artists in Delhi will come to you.